The figure used for this unit is a Heroclix figure from Armor Wars set. Its model number and name are #058-060 / Sunfire. Character Bio - Shiro Yoshida’s mutant abilities first triggered when he came in contact with the radioactive soil of Hiroshima, the same atomic radiation that took his mother’s life. Manipulated by his uncle to use his abilities and take on the codename Sunfire, Shiro made his first appearance as a villain attacking the United States Capitol, where he came into conflict with the X-Men. When Sunfire’s father was murdered by his uncle, Sunfire killed his uncle in revenge, then turned himself over to the authorities. Sunfire was later approached by Professor Charles Xavier and offered a spot on a new team of X-Men. Sunfire assisted the X-Men on their mission against the living island of Krakoa, but refused to join the team. Sunfire continued to ally with and occasionally come in conflict with the X-Men and other superheroes, but always in the interests of protecting Japan. Years later, after losing both of his legs in a fight with Lady Deathstrike and willingly giving his mutant ability to Rogue, Sunfire was forcefully recruited by Apocalypse to become his new Horseman of Famine. Manipulated and controlled by the forces of evil over multiple conflicts, Sunfire was finally freed but left dishonored and disgraced. Wolverine later approached Sunfire and convinced him to once again join the fight on the side of good. Q: Can Sunfire use Raining Fire when he's moved with Honorable Defender or another movement power such as Martian Manhunter's (I) Telepathic Directive? A: No. Raining Fire triggers "instead of attacking", requiring Sunfire to be taking an actual turn. When he's moved by powers such as Honorable Defender or Telepathic Directive he is not taking a turn, and therefore cannot use any powers that trigger "instead of attacking". 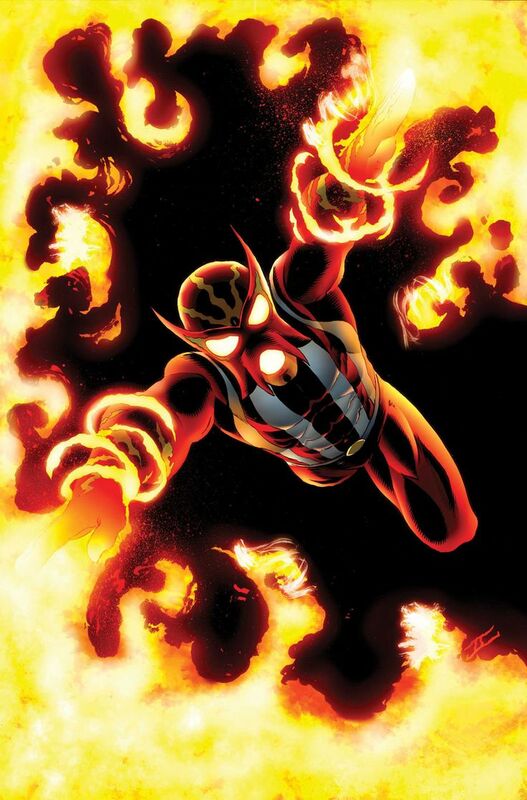 Q: When Sunfire uses Raining Fire, can he choose any or all figures he passed over (without the Lava Resistant special power), or does he have to roll for all figures he passed over? A: He must roll against all figures (without the Lava Resistant special power) that he passed over. As a Mutant, Sunfire has these Mutant Synergies. As a figure with the Flying special power, Sunfire cannot be affected by aspects of certain special powers. Special Powers that Interact Differently with Flying special power. As a figure with the Lava Resistant special power, Sunfire cannot be affected by aspects of certain special powers. Current Special Powers that Interact Differently with the Lava Resistant special power. As a figure with the Lava Resistant special power, Sunfire interacts differently with aspects of certain special powers. Current Special Powers that Interact Differently with the Lava Resistant special power. Figures with Lava Resistant special power cannot be affected by Sunfire's Raining Fire special power. Current figures with the Lava Resistant special power. As a figure with the Flying special power, Sunfire can be affected by aspects of certain special powers. Special Powers that Interact Differently with Flying special power. As a Mutant, Sunfire interacts differently with certain special powers. Special Powers that Interact Differently with Mutants. Last edited by Ronin; November 13th, 2017 at 12:43 AM. After any other figure you control in or within 4 spaces of your Start Zone is attacked by an opponent's figure and receives 1 or more wounds, you may reveal an "X" Order Marker on this card to immediately move Sunfire up to 6 spaces. After this move, if the attacking figure is within 6 clear sight spaces of Sunfire, roll X unblockable attack dice against that figure. X equals the number of wounds the defending figure received from that attack, up to a maximum of the defending figure's Life number. After Sunfire moves with the Flying special power, instead of attacking, you may roll one unblockable attack die against each figure Sunfire passed over that does not have the Lava Resistant special power. Sunfire never rolls for molten lava damage or lava field damage and does not have to stop in molten lava spaces. After an opponent takes a turn, if a figure you control within 4 spaces of your startzone received 1 or more wounds that turn, you may reveal the “X” Order Marker on this card to immediately take a turn with Sunfire. When rolling defense dice against a normal attack from an adjacent attacking figure, all excess shields count as unblockable hits on the attacking figure. Last edited by Viegon; September 28th, 2016 at 08:38 AM. This is one of my oldest write-ups, and I haven’t worked on it in awhile. Sunfire’s powerset is pretty generic for a fire-based character: he can create plasma blasts which he generally uses as projectiles, he can fly, he’s immune to heat, etc. Instead of focusing on his powerset (which I represented in his stats and Lava Resistant), the write-up focuses on trying to capture his personality (arrogant but honorable and deeply devoted to protecting his country). I still like Honor of My Country and how it plays, and an “X” mechanic is an absolute must as he never worked well with the X-Men (and specifically Xavier). I’m thinking Counter Strike could probably be dropped as I’m not sure it’s very iconic for him to be skilled in melee combat (I was going off of Comicvine and Wikipedia when I added it to the write-up). Overall, I’m not too attached to any parts of the write-up and I’m open to tweaks. Thoughts? Obviously, something relating to Japan makes the most sense here; my first thought was a pic of Hiroshima but I couldn’t find anything that seemed to work. So maybe some generic Japan views instead? Last edited by japes; September 24th, 2016 at 06:50 PM. I don't like how it encourages the player to not move figures from their startzone. I wish I had another suggestion for Honor of My Country because I feel that's really important for this character but I don't have one at this time. I like Honor of my Country - definitely feels appropriate. Probably needs a name change, though, as your start zones in Madripoor or Canada definitely aren't Japan. "Honorable Defender" or something. I'll think on it. I'd say cut Counter Strike as well. He's always darting around in my experience, with limited hand-to-hand combat stuff. An "only against range" counter strike might be cool, though. I'm actually not 100% sure if he's immune to fire, actually. Anyone know for sure? I like the theme behind Honor but not sure about it's execution. Have we referenced Start Zones before on a card power? Either way, I don't like the encouragement of start zone pod sitting, that is super boring for the other team. I'd rather see the power move around the board with him as an aura, then he becomes honor bound to defend any of his allies that are under attack rather than trying to tie it to Japan. After an opponent takes a turn, if a figure you control within 4 spaces of Sunfire received 1 or more wounds that turn, you may reveal the “X” Order Marker on this card to immediately take a turn with Sunfire. If you do, Sunfire may only attack the opponents figure that just completed its turn. Then Johnnys ranged counterstrike suggestion sounds fun. When rolling defense dice against a normal attack from a non-adjacent figure within 6 clear sight spaces of Sunfire, all excess shields count as unblockable hits on the attacking figure. Honorable Protector seems an appropriate name. The "after an opponent takes a turn" mechanic is asking for misinterpretation, I fear, due to a player's entire turn and a "turn" that player takes with a figure being separate thing. I know the former is being referenced here, but I'm also confident some folks will read it as the latter, which leads to all sorts of messy turn interruption. Seems like instead we could do it as a once per round after you take a turn, if figures within however many spaces received wounds this round type of thing. Or we could make it automatically after the figure's turn and make it a static movement with an auto wound or unblockable die, more like Bizarro or something like that. Or we could just boost his attack dice for the rest of the round after a friendly figure is wounded, like a riff on Wonder Girl. I think I might like that approach best. I like the theme behind Honor but not sure about it's execution. Have we referenced Start Zones before on a card power? Either way, I don't like the encouragement of start zone pod sitting, that is super boring for the other team. Normally I'm not a fan of encouraging players to sit in their startzone, but I do think it's an interesting territory for designing that we haven't explored yet, and very thematic for the character. And yes, we've referenced Start Zones in powers before (Heimdall and the Bifrost for instance, but I'm not sure if we've used it on any other cards or not). Good call on the name change. I like Honorable Defender. A ranged counter strike would be a fun power, but doesn't seem particularly thematic for the character. I'd rather just go without a defense power to keep the design simple. Sunfire has the ability to form a psionic force field while using his plasma as protection from heat and radiation, both that of his own generation and that from outside sources. 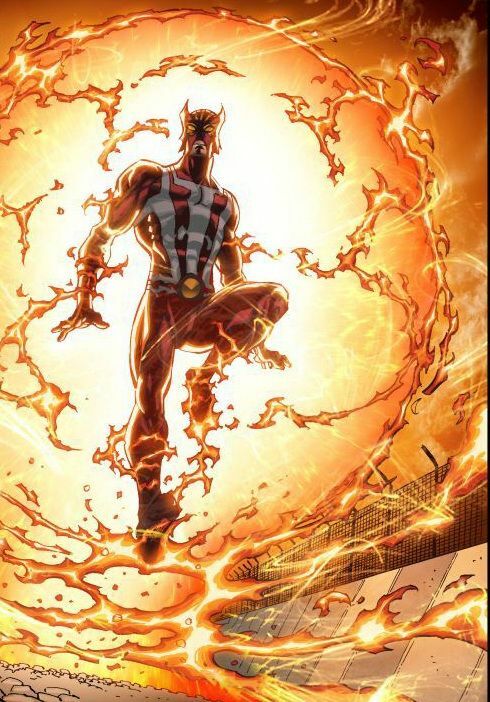 Sunfire also generates an invisible field of psionic energy which protects him from the heat and radiation generated by his own powers, as well as from outside sources. The one other power option I had considered was something along the lines of Pyro's Engulf ability, since Wikipedia, Comicvine, and Marvel Database all mention he can radiate intense heat outwards from him (even to extremes similar to Johnny Storm's Supernova); and I know he does it in other media (such as the old X-Men Legends II video game). EDIT: Missed Bats post; I'm not opposed to some of the other changes to simplify it mechanically, but I also don't think the current power is an issue. We could probably add some extra wording for clarity or even just FAQ it. I like Engulf, especially at a lower roll and then perhaps one more Life to offset no defensive power. Good stuff V.
I like all of that as well. Engulf would be a pretty cool addition. I like Honor of My County (though it's misspelled in the SP) as-is with a name change. I don't think it encourages SZ-podding as much as it punishes the opponent rushing your SZ.